Greetings in Christ our Lord from the land of Nepal. By His grace and mercy, we continue to serve His people in the local church. As we have been ministering to His people, the Lord has given us a burden to show Christ’s love to the needy and poor. It is the Gospel of our Lord Jesus Christ that motivates us to reach out to these needy ones. Nepal is the land-locked country, with around 29.6 million people living there. According to the census in 2011, Nepal is comprised of 81% Hindu, 9.0% Buddhist, 4.4% Islam, 3.0% Kiratism, 1.4% Christianity, and 0.9% other. For many decades Nepal has not been stable politically, socially, or economically. For the last decade the Maoist civil war has crashed the economy of Nepal and has pushed this country back 50 years. Because of this, the common people continue to suffer in poverty. On the 25th of May in 2015, we suffered a massive Earthquake, which devastated much of the northeast. Nearly nine thousand people were killed, and 22 thousand were injured. Many people were left homeless. After the earthquake, the local churches in the area, along with the help of HeartCry Missionary Society, reached out to many of the victims. We supplied rice and building materials to the Kolki village (near the Barpark epicenter). In our second trip, we decided to support some school students with uniforms and books. We visited four schools in that area. During this trip, we found two very need children. They had lost their mom. Because of their very poor background, their father couldn’t take care of their needs. 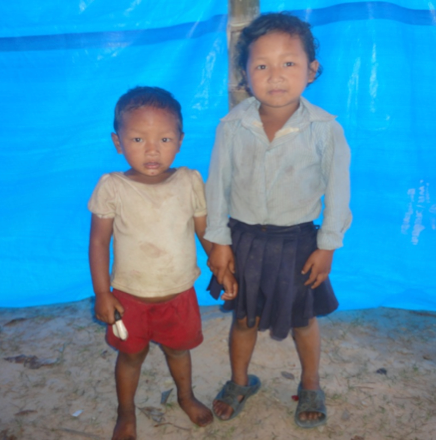 The earthquake destroyed their home, and we found them living in a very small tent. Our hearts broke, and we were not able to leave those children in that situation, so we made arrangements with the father, and took them to Kathmandu. We placed them in a children’s home. By God’s providence, we then found two more children in Palpa. They were 9 and 10 years old when they lost their father. They too are from a very poor family and their mother couldn’t support them. In fact, she is challenged mentally, and could not manage or care for her children. She wanted us to take them to the children’s home in Kathmandu. However, through the Lord's providence we decided to bring these children back to Butwal and start a new children’s home. Along with the 4 children in Kathmandu, we also bought a 10-year-old boy from the mountains who had lost his mom. Her death was sudden, because of her blood pressure. Altogether, we now have five children under our care. We trust in the Lord, knowing that He is the Provider of the needs of His people. 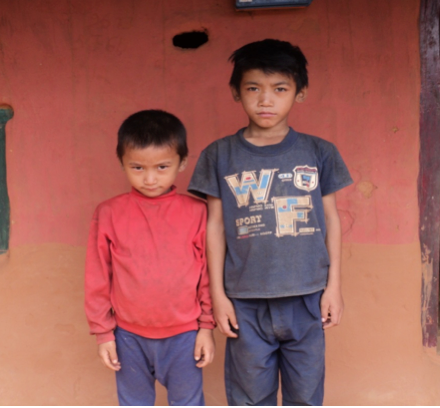 So far, many local churches (Reformed Churches of Nepal) along with many individual people are supporting these children for their schooling, clothing, food, and medical expenses. People have given various gifts like money, rice, wheat, vegetables, etc… We desire this home to be a local church ministry and we are encouraging our people to support these needy and poor children. We are praying that the Lord would supply all that we are lacking. We praise the Lord for Kalpana, Karian, and Arpana who are helping care for these children. God has given them this burden. Mani Raj (the younger one) is studying in class one, Gauri is studying in class three, Sujan (in the middle) is studying in class four, Suman is studying in class five, and the elder one (Man Bdr) is studying in class six. These kids are full of excitement. They sit together daily for devotions and attend the local church. May the Lord bless these children and bring them in saving faith. Please continue pray for these children, that they may know Christ as their Savior. Pray for us, as we teach them by our examples, and share the gospel with them (Deut. 6:5-7; Eph. 6:4). May the Lord raise some of them to be missionaries. Pray for wisdom as we go forward in the eyes of the government. We are seeking wisdom, without compromising, as we try and raise these children in a healthy spiritual atmosphere. Pray for the financial need of the children. Pray for these sisters Karina, Kalpana, and Arpana- as they share the responsibilities within the house.